The Brimmer Street Theatre Company has announced it will present the world premiere of Summer in Hell by Miles Brandman, directed by David Jette, at studio|stage in Hollywood, with performances beginning on Thursday, November 11. Opening night is set for Saturday, November 13 at 8:00. 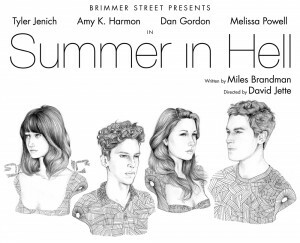 Summer in Hell will play a limited engagement through December 18. Summer in Hell tells the disturbing tale of cousins Milton and Patricia, who, behind the closed doors of their family’s summer estate, are enjoying a less than savory relationship. Their secret is threatened when a local boy stops by for an impromptu visit, setting into motion a battle royale of treachery and deceit. The cast will feature (in alphabetical order) Dan Gordon, Amy K. Harmon, Tyler Jenich, and Melissa Powell. The set design is by Sarah Krainin, lighting design is by Ian Garrett, costume design is by Fabiana Pigna, and Joseph L. Roberts is the production stage manager. There will be two lower-priced preview performances of Summer in Hell on Thursday, November 11 and Friday, November 12 at 8pm, and opening night is set for Saturday, November 13 at 8:00. THE MEDIA IS INVITED AND ENCOURAGED TO ATTEND THE OPENING NIGHT PERFORMANCE ON SATURDAY 11/13, BUT IS ALSO WELCOME AT ANY OTHER PERFORMANCE AFTER THAT DATE. The regular performance schedule will be Thursday, Friday and Saturday at 8pm through December 18 (no performance on Thanksgiving Day, Thursday, November 25). All tickets for regular performances are $15 (previews are $10). To purchase tickets, visit www.BrimmerStreet.org or call (213) 290-2782. A portion of the ticketing fees for all Brimmer Street productions goes toward supporting LA Stage Alliance through their partnership with Patron Technology. studio|stage is located at 520 N. Western Avenue, in Los Angeles, 90004. Street parking is available. Lily Tomlin has been set to host as the Casting Society of America fêtes their own on Monday, November 1, 2010, at the 26th Annual Artios Awards® in Los Angeles. The L.A. awards ceremony will be held at the Hyatt Regency Century Plaza Hotel (reception will commence at 5:45 p.m. PST) and simultaneously at American Airlines Theatre in New York. For Los Angeles ticket information, please call (323) 463-1925, or inquire via email at info@castingsociety.com. Each year, in addition to the awards presented to casting directors for their achievements in Theatre, Television and Film casting, the Casting Society of America also recognizes industry notables with a Career Achievement Award, the New York Apple Award, and the Hoyt Bowers Award. This year’s honorees are: producer Marcy Carsey (The Cosby Show, Roseanne, 3rd Rock From The Sun, Grace Under Fire, That 70’s Show), who will receive the Career Achievement Award, and casting director Ellen Chenoweth (Terms of Endearment, Good Night & Good Luck, O Brother, Where Art Thou?, Michael Clayton, No Country for Old Men, A Serious Man) who will receive the Hoyt Bowers Award. Scheduled award presenters in New York include Josh Charles, Jim Gaffigan, Charles Kimbrough, John Benjamin Hickey, Aasif Mandvi, Elizabeth Marvel, Scott Porter, Zachary Quinto, Christina Ricci and John Slattery. Jeffrey Wright will present the 2010 New York Apple Award to honoree Tony Award-winning playwright, Tony Kushner. The Artios Awards were first given in 1985 to honor excellence in casting and the ceremony was held at the Crystal Room of the Beverly Hills Hotel attended by 500 industry leaders. The first New York awards were given in 1988. 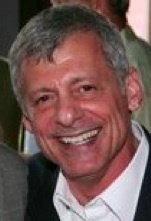 The CSA is the premiere organization of theatrical casting directors in film, television, and theatre, and is passionately committed to establishing a recognized standard of professionalism in the industry; enhancing the stature of the profession in the industry; freely exchanging information and ideas among members; providing the opportunity to honor the outstanding achievements of its members; and providing members with professional support and resources. CSA members are a united professional society that consistently set the level of professionalism in casting on which the entertainment industry has come to rely. With more than 425 members, the CSA has representation not only in the United States, but also Canada, England and Australia. For more information, or to become a member, visit www.castingsociety.com. K2, the mountain, is the second-tallest peak on the planet, rising to an elevation of 28,251 feet on the border between Pakistan and China. 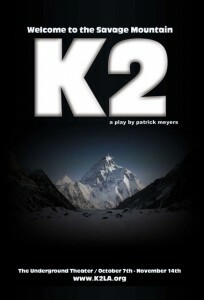 K2, the play, is a 75-minute harrowing tale of two mountain climbers (Sean Galuszka and Jake Suffian) who are stranded on a ledge at 27,000 feet. After an accident leaves one of the men with a severely broken leg, the two survive the night only to confront the fact that they do not have the necessary equipment to rappel to Base Camp safely. K2 is the story of two contentious friends and their struggle to solve an impossible problem. It is a tale of friendship and morality, of love and mortality, of climbing, quantum physics, and the search for God. Tickets for all remaining performances are $15, except for Thursdays (October 28 and November 4 & 11), when patrons may name their own ticket price (minimum $1.00), cash only at the door. Regular price tickets are available in advance by visiting www.K2LA.org or by calling (800) 838-3006. The Underground Theater is located at 1314 N. Wilton Place in Hollywood. Plenty of street parking is available.